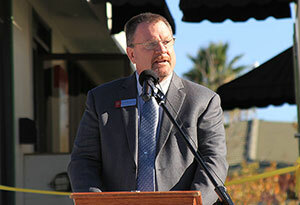 Simpson University celebrated the grand opening of its new Veterans Success Center on Nov. 17 with a ceremony highlighted by special music, a flag-raising, and expressions of community support. About 100 people attended the morning event outside the new center, located in modular building 7 on the west side of campus. Tours of the facility, which includes computer stations and a study room, as well as concessions and a lounge area, followed the ceremony. The chorale, under the direction of Dr. Cyril Myers, then sang “Armed Forces Salute,” a medley tribute to the five branches of the U.S. military: Air Force, Army, Coast Guard, Marine Corps, and Navy. University President Robin Dummer acknowledged the veterans in attendance and shared about his family’s history of military service. 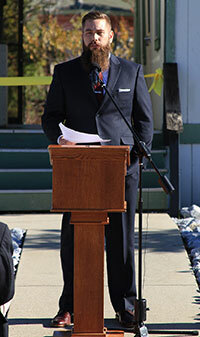 He introduced Justin Spears, the university’s first veterans services coordinator. Spears, who served as a Navy hospital corpsman, is completing a master of arts in intellectual leadership at Tozer Seminary and is studying the state of veterans higher education in the U.S. In addition to the Veterans Success Center, open weekdays to service members, U.S. military veterans and their guests, the university’s initiative also includes the Success Advocates for Veterans Education (SAVE) team, Spears said. The team comprises 10 on-campus department representatives and four community resources to help with education, health and wellness. Spears is also working on starting a veterans student club on campus and veterans mentorship programs, among other efforts. Tommy Key, Shasta County’s veterans services officer and a retired Air Force Senior Master Sergeant, also shared his excitement about the new center and pledged support. “I’ve watched this group come together over the last seven months, and what they’ve done here is remarkable,” he said. Erin Ryan, a representative from U.S. Congressman Doug LaMalfa’s office, presented a certificate to President Dummer in recognition of the university’s efforts to support veterans. Bott, who is also a radio host at KCNR 1460 AM, facilitated a cake-cutting ceremony by Marine Corps Sgt. Quintin Mitchell, which honored the crowd’s oldest and youngest veterans, former state Sen. Maurice Johannessen and Marine Gunnery Sgt. Jose Mendez. Johannessen, a longtime veterans advocate, was instrumental in bringing a state-run Veterans Home and the Northern California Veterans Cemetery to Shasta County. An estimated 19,000 veterans live in the county. 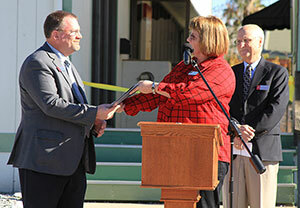 Spears cut a yellow ribbon to open tours of the facility, using a Ka-Bar combat knife from a veteran in the audience who served in Afghanistan. Learn more about the Veterans Success Center at simpsonu.edu/veterans.